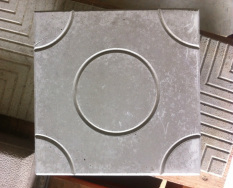 The Concrete Paving Block is a 200 x 200 x 38 mm thick concrete paving block. 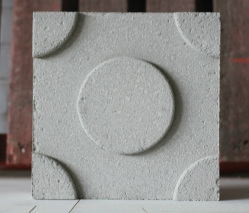 This block is made with an aggregate made up of recycled crushed brick, recycled concrete and sand. Once the product is dried it can be honed to bring out the interesting aggregate mix. These pavers can be made to order in terms of size, patterns and mix design. 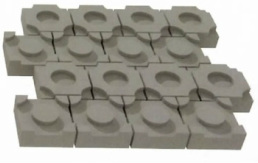 The Pressed Paving Block is a 200 x 200 x 25 mm thick paver made with compaction and vibration. The pavers have a rustic appearance and can be custom made to any particular pattern. 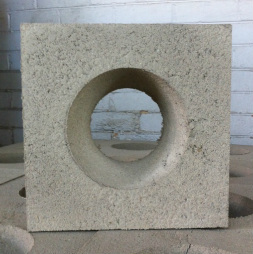 The Cone Breeze Block is a handmade concrete block using vibration and manual extraction. 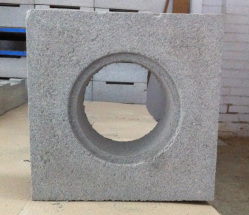 The block size is 290 x 290 x 90 mm thick with a 170 - 130 mm tapered hole. 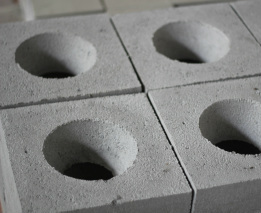 These blocks can be used for privacy screens, sunscreens and many general decorative masonry applications. 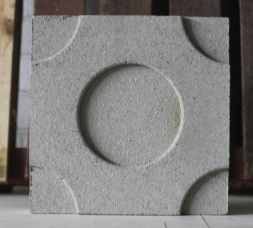 The Recessed Pattern Block is a 290 x 290 x 110 mm pressed concrete block. 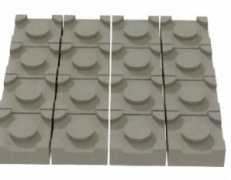 These blocks are created to 15 mPa strength and are able to be used for most domestic load bearing applications. When the block is used in stack bond it creates a series of circle impressions across the surface. 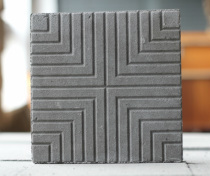 The Raised Pattern Block is a 290 x 290 x 110 mm pressed concrete block. 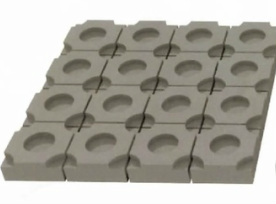 these blocks are created to 15 mPa strength and are able to be used for most domestic load bearing applications. When the block is used in stack bond it creates a series of raised circles across the surface. 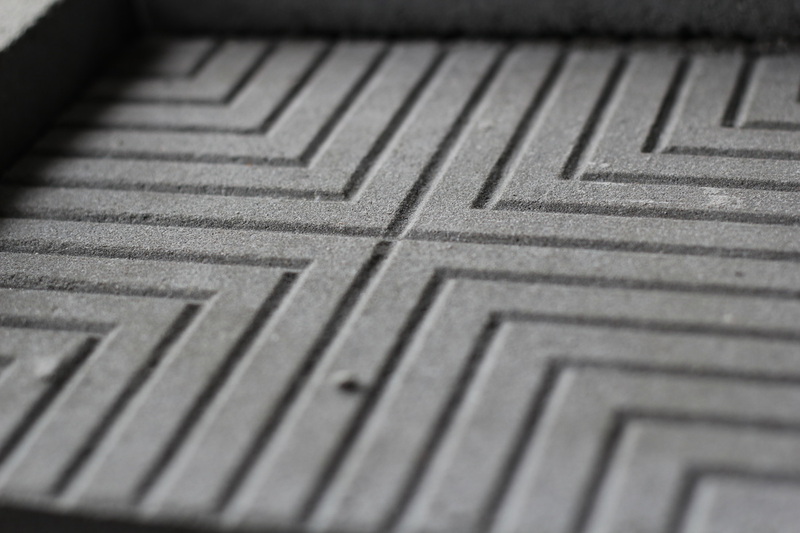 When the Pattern Blocks are used in alternate rows in stretcher bond they create an alternate geometric pattern. 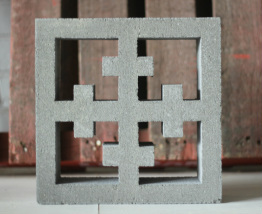 The Cross Breeze Block is a 290 x 290 x 110 mm pressed concrete block. The block is created to a strength of 3 mPa and is generally suitable for non load bearing masonry. 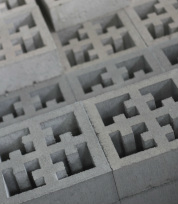 These blocks are typically used for screening, shading or decorative purposes. The Round Glazing Block is a 290 x 290 x 90 mm handmade concrete block with a 150 mm void through the block along with a 10 x 10 mm rebate to enable the block to be glazed with either glass or perspex. This block is excellent for external non load bearing walls much the same as an application of a window. 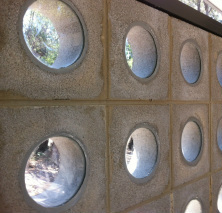 The Round Glazing Block creates privacy and allows for light penetration.